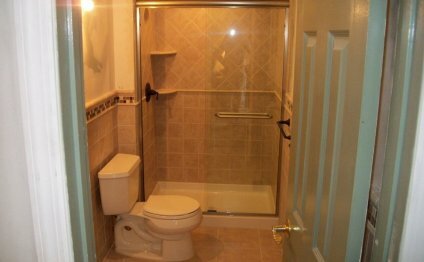 Simple bathroom remodels can go a long way. Whether it’s a new coat of paint, a new toilet, a new vanity or a new backsplash, sometimes, the smallest updates can make the biggest difference. That was certainly the case with Laurie Hall’s bathroom. Laurie currently lives with her husband outside Plainview, TX. They have two kids who have since moved out. With more time on her hands, Laurie decided it was finally time to remodel her outdated bathroom. See how Laurie transformed her bathroom for approximately $4, 000. As you can see above, Laurie’s bathroom was lacking some privacy. While open concept is great for the kitchen and living room, when it comes to the bathroom, people want their privacy. Therefore, Laurie decided to extend the half wall between the tub and toilet all the way to the ceiling. As a true DIYer, she handled this structural change with only the help of family and friends. The milk chocolate brown and yellow tile just wasn’t doing it for her anymore. Besides being outdated, the dark brown brought in shade and darkness that no one wants in their bathroom. Therefore, she got rid of the tile, adding some drywall and put a beautiful stone tile backsplash. As you can see from the pictures above, not only is the new bathroom ready to make it’s 2015 debut, but it also takes away the darkness that once overpowered the entire bathroom. New cabinets or cabinet makeovers can transform any bathroom across the country. Your cabinets should make a spark in your bathroom and that’s why Laurie decided to remove most of the doors on the existing cabinets, paint the existing cabinets and replace the pulls on all drawers and two remaining doors. As you can see in the after picture above, the pulls match that of the new bathroom vanity. Consistency is imperative when remodeling, especially if you want to keep a traditional or transitional look. Perhaps the biggest upgrade in Laurie’s new bathroom was her vanity. The floating vanity from before wasn’t working out. So, Laurie decided to install a brand new marble vanity with plenty of storage (not that it’s an issue in this bathroom). The additions look outstanding, Laurie. With enough storage, Laurie decided to get rid of the three cabinets above the vanity and add recessed lighting. She covered the cabinets by removing the doors and nailing a piece of sheetrock before adding texture and paint. Now, the top walls blend in with the rest of the bathroom.